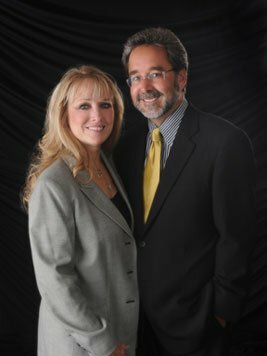 We have read about the tremendous health benefits of using olive oil in our daily diets, on our skin, and in and around the home. But when it comes to choosing the right olive oil for its intended purpose, it can be very confusing. Many times shopping for a perfect, high quality olive oil for your family can feel like a task better suited for a food scientist. 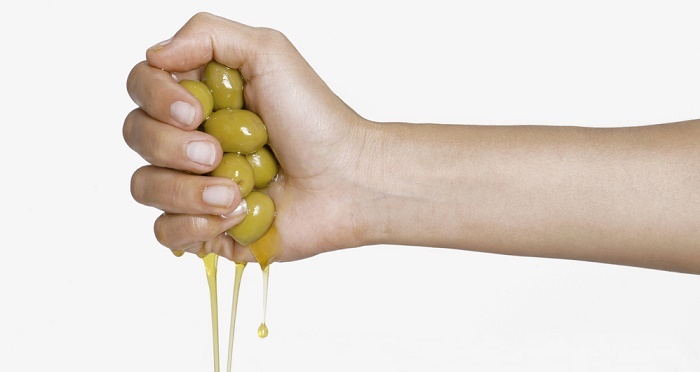 So what should you look for when selecting the perfect olive oil for your tastes and needs? As you scour the shelves of today’s supermarkets for the perfect olive oil, you will notice that the types and varieties are expanding almost daily. 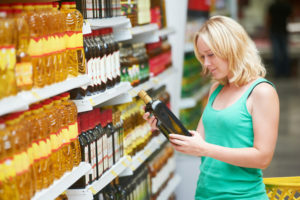 With multiple brands varieties, and grades available from all over the world, it is easy to imagine the olive oil section becoming as extensive as the cereal aisle! Just yesterday, as I was looking through the olive oil selection in a local supermarket here in Oregon, I found 35 different types of olive oil on the shelf—not counting various sizes of the same brand! These olive oils were imported from California, Italy, Spain, France, Greece, Sicily, Morocco, Tunisia, Turkey, Argentina, etc. I read labels that described the oil as extra virgin (strong, medium, or mild), virgin, light, filtered, stone milled, cold pressed, first cold pressed, natural, and organic. The olive oil colors ranged from a hazy greenish to almost a clear light golden color, and were described as sweet, robust, rich, fruity, balanced, mild, nutty, complex, peppery, bold… The list goes on! This can be totally confusing! After coming home and doing some brief research I found that there are three basic grades of edible olive oil: Extra Virgin, Virgin, and Olive Oil. Extra Virgin Olive Oil includes, Premium Extra Virgin and Extra Virgin. Virgin Olive Oil includes Fine Virgin and Virgin. And, Olive Oil includes what used to be called Pure Olive Oil and Refined Olive Oil. Extra Virgin and Premium Extra Virgin Olive Oils: Extra signifies low free oleic acidity—as low as 0.225% for Premium Extra Virgin and no more than 0.8% for Extra Virgin. Virgin means that it comes from the first pressing (without the use of chemicals or solvents), both critical factors when determining high quality oil. Extra Virgin Olive Oil holds a superior, fruitful flavor and odor, with no defined sensory defects. Both Premium Extra Virgin and Extra Virgin Olive Oils are best suited for uncooked uses in order to maximize its exquisite flavor and aroma. Similar to wine, use Medium, or Mild Extra Virgin Olive Oil when paring with mild flavored foods, and Strong Extra Virgin Olive Oil over robust and hearty dishes. Extra Virgin and Premium Extra Virgin Olive Oils = High Quality Olive Oil with a Superior Taste! Virgin and Fine Virgin Olive Oils: Virgin oil also comes from the first pressings (without using chemicals or solvents), but is slightly lower in quality, with the free oleic acidity levels of Fine Virgin Olive Oil containing no more than 1.5% and Virgin Olive Oil containing less than 2%. Virgin and Fine Virgin Olive Oils both have a good, fruitful flavor and odor. Virgin and Fine Virgin Olive Oils = Good Quality Olive Oil with a Good Taste. 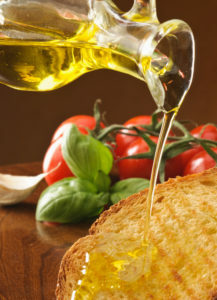 Olive Oil and Refined Olive Oil: Olive Oil is a blend of Refined Olive Oil and Virgin Olive Oil. Refined Olive Oil is made by treating low quality Virgin Olive Oil through refining methods such as heat, chemicals, and/or filtration. Olive Oil and Refined Olive Oils are typically clear, odorless, and flavorless and are used in cooking or in food packaging. Olive Oil and Refined Olive Oil = Acceptable to Poor Quality Olive Oil. At My Olive Tree, we are committed to producing only the highest quality, Extra Virgin Olive Oil. Place your order today for My Olive Tree’s Extra Virgin Olive Oil from Israel… You won’t be disappointed!